Admiring the view from the Longhouse. The back of the Longhouse. Stunning views from the dining room. 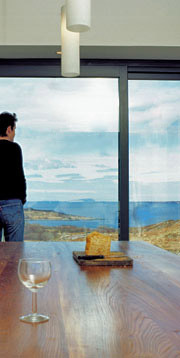 The Longhouse at Tokavaig is a stunning architect-designed home with one of the finest views on the whole of Skye. Set in native woodland on the west coast of the Sleat Peninsula, known as the “Garden of Skye” for its flora and fauna, the Longhouse is a place to escape to and relax in isolation, or bring your family and friends and entertain. The spacious open-plan kitchen has underfloor heating and a hand-crafted elm dining table at its centre, capable of seating 12 comfortably. Soak up the views through the floor-to-ceiling windows to the islands of Canna, Rhum and, on a clear day, even Barra in the Outer Hebrides. Or retire to glow of the wood-burning stove in the lounge, where the window looks west to the entire Cuillin mountain range, the most challenging peaks in Britain. The sunsets over their distinctive summits have to be seen to be believed. This is a substantial and luxurious house with four good-sized double bedrooms, two bathrooms with powerful showers and even a constant supply of pure spring water on tap from its own borehole. 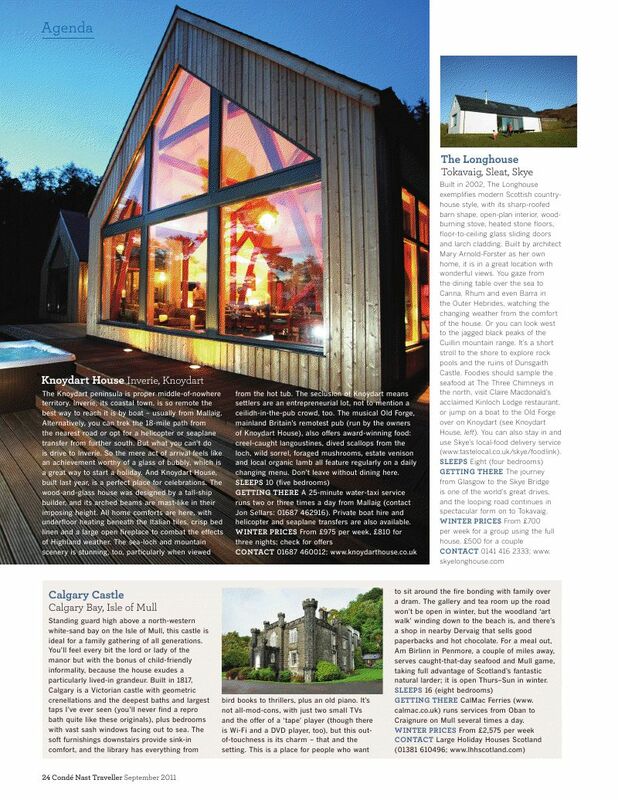 The Longhouse was featured in Condé Nast Traveller magazine, as "exemplifying modern Scottish country-house style". Click here to view the article. Skye is one of the world’s most magical islands, which has something to offer everyone, whatever their interests. From world-class climbing in the Cuillin, kayaking round the coves and outlying islands, to cycling, whalewatching, horse riding or painting, there is no shortage of activities, regardless of the weather. Sleat is the southernmost point of the island, where the Gulf Stream ensures there is colour and greenery all year round. The looping road to Tokavaig is recognised as one of the best drives in the country, offering unparalleled views of the Cuillin.